In Cameron Highlands, I took my family to try some strawberry roti canai. Yes, you read that right. 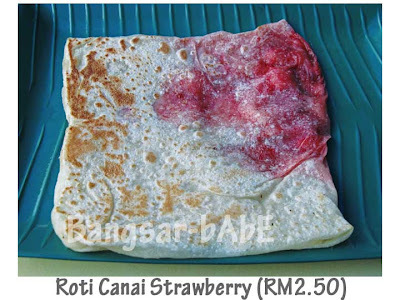 Roti canai with strawberries. Went to my usual mamak shop (one that I used to frequent when I was there for church camps). I used to sneak out of the camp site and went down to Tanah Rata (just a 10 minutes walk) so that I could eat it. 😛 The roti canai was still good. Soft and fluffy with mashed strawberries and sugar sprinkles inside. The strawberries and sugar combo was tangy and sweet, deliciously complemented with some condensed milk. I ate my roti with a cup of kopi panas – the perfect fix for a rainy day. Verdict: Not fantastic, but something different. Who knew roti canai could be so versatile! I forgot the name of the mamak, but it’s the first mamak shop along the shoplots in Tanah Rata. hey, I’ve been the Cameron son many times, never knew they have this. SHould give a try one day! SimpleGirl – Yes, you should try it if you’re there.